Mobile health (mHealth) technology encompasses a wide range of potential clinical tools, with end-users ranging from the individual patient to national healthcare systems. This chapter focuses on mHealth with the patient as the end-user. 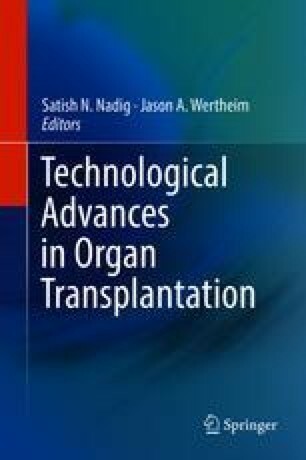 It describes mHealth applications studied within solid organ transplant, as well as applications that have been used in non-transplant patients with chronic diseases common in transplant. It also provides an overview of fundamental necessities for successful mHealth systems and provides a roadmap to addressing current barriers to widespread study and implementation of mHealth. Smith A. U.S. smartphone use in 2015. www.pewinternet.org/2015/04/01/us-smartphone-use-in-2015/. Published April 1, 2015. Accessed 8 Apr 2016. McGillicuddy, J., Gregoski, M., Brunner-Jackson, B., et al. (2012). Facilitating medication adherence and eliminating therapeutic inertia using wireless technology: proof-of-concept findings with uncontrolled hypertensives and kidney transplant recipients. In Proceedings of the Conference on Wireless Health, New York, HY, USA, doi: 10.1145/2448096.2448108. USDHHS FDA. Mobile Medical Applications: Guidance for industry and food and drug administration staff. http://www.fda.gov/downloads/MedicalDevices/DeviceRegulationandGuidance/GuidanceDocuments/UCM263366.pdf. February 9, 2015. Accessed 20 Apr 2016. DHHS CMS. Telehealth services. https://www.cms.gov/Outreach-and-Education/Medicare-Learning-Network-MLN/MLNProducts/downloads/telehealthsrvcsfctsht.pdf. December, 2015. Accessed 20 Apr 2016.